Visit the showcase site for The Norton Introduction to Literature. The Norton Introduction to Literature offers the ideal mix of the stories, poetry, and plays at the heart of every literature course. New contemporary selections include a compelling array by authors such as Junot Díaz, Jennifer Egan, Quiara Alegría Hudes, Patricia Lockwood, and Kevin Young, as well as newly added classroom-favorites by Tim O’Brien, William Gibson, Toni Cade Bambara, Langston Hughes, Philip Larkin, and August Wilson. These highly teachable works engage a single topic from multiple perspectives or explore a particular work in depth, putting diverse authors in conversation with each other and making lesson planning easier. Six Writing about Literature chapters offer fuller coverage of the process of turning insightful ideas, interpretations, and arguments into well-written essays. At-a-glace answers to common writing concerns help students stay on track and assignment-specific coverage includes tips on comparison essays, essay tests, and a fully annotated sample research essay. New Writing about Literature videos—developed specifically for The Norton Introduction to Literature—guide students through the fundamentals and offer additional perspective on how to write effective essays. New Pause and Practice exercises offer additional opportunities to practice effective writing, while Reading, Responding, Writing genre openers provide students with clear, organized frameworks to analyze and write about the stories, poems, and plays featured in the text. 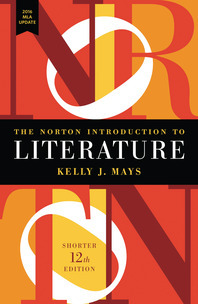 The Norton Introduction to Literature has been refined over twelve editions to provide the deepest engagement with historical and critical contexts, and how they shape a reader’s understanding of literature. An unparalleled collection of contextual chapters complement the traditional analysis common to all introductory anthologies, and a new chapter on “The Things They Carried” offers students an in-depth look at the background and scholarly debates that surround O’Brien’s seminal work. Revised and expanded LitWeb workshops—55 total—provide supplemental media on authors and their texts, and refreshed works, essays, critical documents, and resources inspire insightful student writing. Every element of the Norton Introduction to Literature media package is available in a free, downloadable Coursepack. In addition to the new Writing about Literature video tutorials and new Pause and Practice exercises, instructors also can embed every LitWeb workshop and comprehension quiz into the LMS of their choice. LitWeb has been revised and expanded to offer more resources than any other anthology to improve students’ close reading and writing skills. Literary Workshops (10 of which are new), quizzes (25 of which are new), tutorials, and more are available at no cost, making these comprehensive resources easier to access and assign than ever before.